Nybo Gård is situated in Vemhån, Härjedalen. 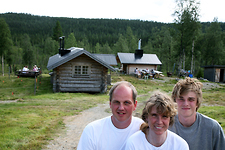 Since 1990 Anna, Torbjörn and Manne, have lived and worked on the farm which is Torbjörn's father's home built in 1931. We breed Highland cattle and sell their meat in the form of meat boxes, cuts, smoked, air-dried and as sausages and we use these products also in our little restaurant. We have a farm shop with a bakery where hard and soft flatbread is baked and where we sell our meat, sausages, flatbread and some other things. 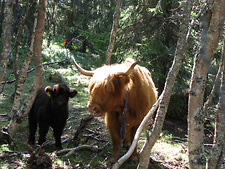 In summertime we (and the cows) live at our summer farmstead, called Vikarvålvallen. It is nicely and high up located 15 kms from Vemhån at the foot of Digervålen. Here it has been pasture operation since at least 1894, probably longer and this is where we have our restaurant and café. It is very important to us that the food is natural and locally-produced. Our animals grow slowly and all the meat and sausages we sell come from animals that are about two years old which means that the meat got time to mature. Then you get a light marbled and flavorsome meat. When you buy our meat you know that it is very tasty and comes from animals that had a good life. We are very proud of what we're doing – our living at the summer farmstead, our livestock and working with it. We would really like to welcome you to Nybo Gård – our favourite place on earth. We sell firewood and Christmas trees from our own forest and can help you clear snow with our tractor. We sell experiences that include wildlife watching such as bears and moose. Experiences can be booked for a few hours or a day with an overnight stay. Please contact us if you want to know more about Nybo Gård or if you would like to ask about our products and services.